Back to the classics (?!) with another Eat - Shop - Repeat and this, is a good one!! The pictures speak for themselves and make you drool with just one glance - or it's just me.. The past week was one of my favourites, it was my birthday, me my friends went for a picnic and... I bought a new camera!! 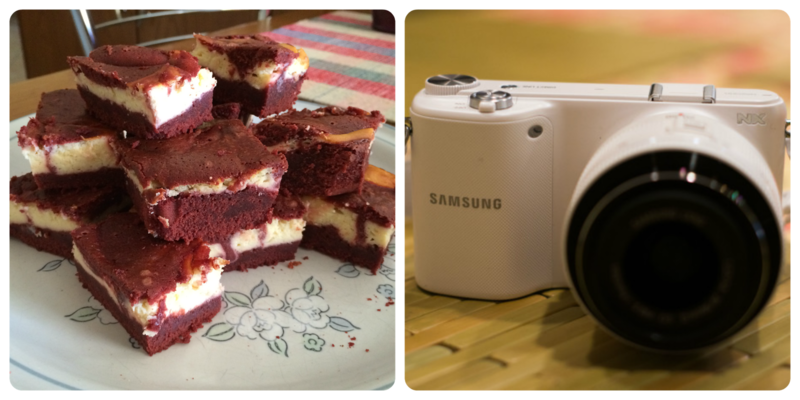 So without further ado, let's get to it..
EAT : So as I said, we went for a picnic in the park and we decided for each of us to contribute with either a sweet or a savory treat, with mine being : Red Velvet Cheesecake Brownie Swirls (link)!! Ok it is a mouthful, but that's a good thing for a brownie, right?? Just bare with me.. It's a brownie and a cheesecake and it's red velvet on top of that.. What's not to love?? I swear it's the best brownie I've ever had and it isn't quite so difficult to make.. for the recipe click on the link above and you won't be disappointed, at all!! SHOP : I'm trying so hard not to leap from joy as I'm about to say that now I have my very own camera!! I've wanted one for so long and I was always postponing it but now I set my mind to it and I got it.. and let me tell you she's beautiful - not quite a trait for a camera but what can I say..? I got the Samsung NX2000 (link), a mirrorless camera, which is actually if a compact camera and a DSLR had a baby!! I've had it only for a couple of days and I'm trying to explore it's full potential which I'll never get to do because I don't know a thing about photography, but I'm at least trying and it's something! !